I'm going to be straight with you - I don't see why this film in is the top 100. OK, it can be considered a 'good watch' (if not a particularly easy one), and sure the cinematography etc is rightfully praised, but the TOP 100? I'm not so sure. 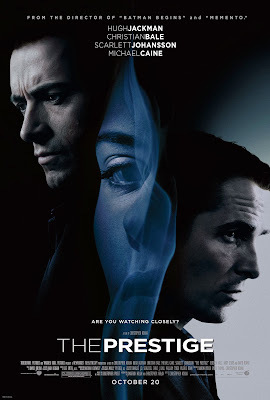 Let me give you an overview before I start my rant: Christopher Nolan co-wrote the screenplay with his brother, and directed and produced this film, so The Prestige is overwhelmingly his responsibility. The film is based on Christopher Priest's 1995 novel of the same name; reportedly the author was impressed with the adaptation. 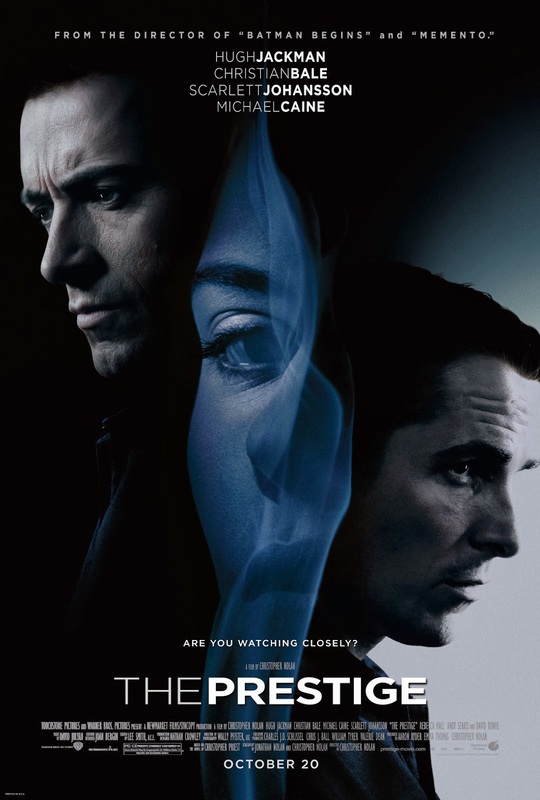 The plot revolves around two rival magicians, Christian Bale as Alfred Borden and Hugh Jackman as Robert Angier, making for a very frowny cast. The two are engaged in a fierce feud of 'one-upmanship', perpetually attempting to ruin the other's show/reputation/life and invent the best trick ever. The story is told in a confusing and complex non-linear narrative style, preventing any conversation in the audience, and general fun. The feud escalates, as eventually Borden faces the gallows and Angier loses his fortune, mind and several lives creating the ultimate magic trick. There is a considerable plot twist at the end which - don't worry, I won't reveal - has divided critical opinion over its effectiveness within the larger framework of the film. Seeing as the author was so impressed with the screenplay, perhaps we should start here. Priest's novel was written in an epistolary style (that means in letters), which is exceptionally hard to translate into a screenplay. In order to capture what is described as the heavily literary themes of the book and the switching between points of view, the brothers Nolan decided on the non-linear narrative form and included the use of journals in the film, and importantly the stealing of said journals. The reading of the stolen journals reflects the intimacy and mutuality of the two men's obsessions and rivalry, their minds always occupied with the workings of the others'. I'm not the first to bring up the significant lack of character depth here, this being an intensely plot-lead film. Without the feud these men would be formless. But then, I suppose that's the point. Borden and Angier have become so wrapped up in the other that they have limited their own existence, a tragedy to those who love them. My main complaint about this film is that it really needs to decide what it is. Sure, it's "dealing with themes" like science and magic, love and hate, obsession, rivalry, ambition, and ultimately what all of the above can drive a man to do. Still, The Prestige seems to jump from Jonathan Creek to the X-files without a flicker of an eyelid, leaving us wondering what we just saw. As better critics have said, we prefer to know what we're dealing with from the off. Instead, we have a complex mishmash, with the audience feeling simultaneously under- and overwhelmed: "wait, so that's really science not magic, and that's really magic not science? But, wait, which is science and which is magic again?" Again, I guess that's the point, but it would be nice to be more sure that Nolan didn't just stumble across the duality. No, he didn't stumble across the reigning theme of duality, seeing as it's present everywhere. The Edison/Tesler rivalry over the mastery of electricity proves to be a strong and real-life double of the magicians' feud, and dualities exist everywhere else too. The point is to explore the two sides of man - but, not the good and the evil exactly. It's more, what man can achieve, and what they're willing to sacrifice. The duality in man becomes that of ambition and humanity. In the end, neither man seems particularly humane, the use of science and magic providing a suitable backdrop to both their struggles. It's a shame we don’t care about either of them though.